Down had their chances. They had as many possessions as Donegal . They had more shots than Donegal. But in the end it was their execution, especially whilst shooting from play, which let them down. You can implement the perfect system but if you can’t get the ball over the bar you can’t win. Given the nature of the commentary re the defensive tactics employed in the game the overall volumes of possessions don’t look too bad. This was due to both teams withdrawing into their 45m allowing the opposition to, relatively speaking, walk the ball up until the defense was ready to engage. Getting into the 45, and thus gaining a possession, wasn’t the difficult part. The difficult part was getting a shot off from the right area with the right shooter. Both teams’ low Shot Rates reflect this. In the first 30 minutes both sides had four shots from play. Donegal’s four came from Murphy (x2), McBrearty & McFadden and yielded 3 points. Down’s four came from Quinn (x2), Mooney & Boyle with none of them registering. Donegal had the patience and discipline, having played this system for so long, to ensure that their best shooters took their shots. Neither team mustered a shot at goal which is not entirely surprising given the formations. Down’s shooting from play was quite poor – though Donegal deserve as much credit for this as Down deserve admonishment. All 14 Down shots were taken with Donegal pressure being applied to the kicker. So much so that three of the shots were blocked. In a physically absorbing game that is tremendous hustle and concentration from the Donegal defence. McFadden got a point late in the second half from a Down pass that went astray inside their own 45m. Nothing similar happened within Donegal’s ranks. Donegal’s shooting was above average. The combined returns for both this and the Tyrone game now show a 61% Success Rate (14 scores from 23 shots). That is excellent but can it be maintained? Or once they meet more open teams will the extra shots mean they can absorb the inevitable regression to the mean? If you wanted to find a chink in their offensive armour then you could possibly look at Murphy & McFadden taking 57% of all shots from play. Tony McEntee addressed this issue in Monday’s Examiner [here] though he focussed solely on McFadden. Stop just two forwards and you blunt Donegal. Easy – except two of the better managers, in Harte & McCartan, have known this and not been able to accomplish it. The problem is that if you do sell out on the Big 2 the remainder of the team is highly accurate when called upon. See here for details within a pre season piece I did on Donegal. They just haven’t needed to be called upon to date. Pick your poison. Genuinely excellent shooting all around. Murphy is the first player to get a weighting above 1.00 this year – and he smashed through it. Not only that but his returns would have been even better if when the referee brought a free forward 13m he let the original successful strike stand. He hit a monster of a shot from c50m and to the left of goals towards the end of the game which just epitomized his day from the ground. The bare numbers do not do O’Hara’s day justice. His only miss was one against the wind that hit the post. Plus some of his frees with the right foot from the right hand side of the pitch were extremely difficult. You always get the sense that no stone is left unturned with Donegal in this area. Given that O’Hare has a pronounced right footed action it is no coincidence that only one scoreable free was given on Down’s left (the strong side for O’Hare’s action). 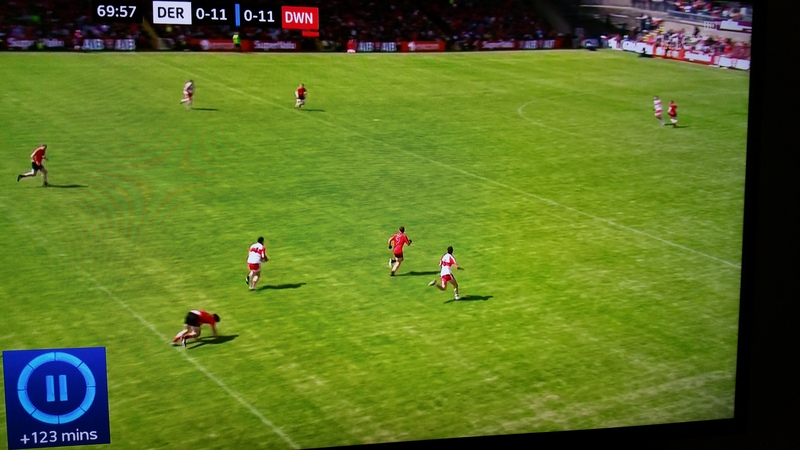 Against Tyrone despite a high deadball count (10) very few frees were given inside the 45m line. Although Morgan had an excellent League final up to that he had been patchy. Donegal were not afraid of the aberration, the League final, and ended up using a perceived strength of Tyrone’s to undermine them. You often hear commentator’s state that one way to beat the blanket defence is to kick over it. Down had 6 shots, fairly central, & from c38 – 48 metres out that would probably meet the definition required to successfully kick over a massed defence. They only converted one however. The problem with trying to kick over a massed defence is (a) they can still pressure the shooter as they have so many back (b) this pressure leads to an already more difficult shot becoming harder again and (c) it is not always your best shooter in this position. I think this may be one of the keys to Donegal’s excellent shooting stats … they get the big three, especially McFadden, taking shots further out the pitch than would be expected of a normal full forward line. Donegal did not go short once against Tyrone however in this game did so four times. The main reason for this was that Down forced them to. 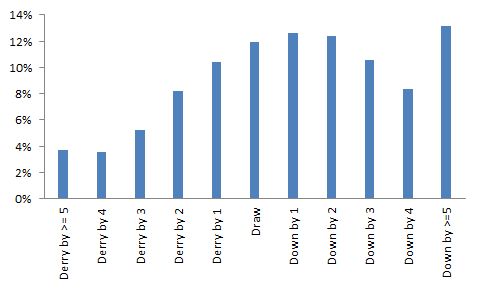 Donegal’s first five kickouts went medium/long – a continuation of the pattern against Tyrone. Down however won three of those first five kickouts and forced Donegal into a rethink. Donegal then went short on four of the remaining six. Something similar happened Down. Eight of their first ten kickouts went medium/long with Donegal winning five. Five of the next six went short. Though the stats show that both teams secured a majority of their own kickouts this was only done by switching to shorter kickouts after the opposition had negated their original plan. A lot of the focus has been on Mayo’s 20 minute ‘collapse’ in the 2nd half. Dublin did have 10 of 11 possessions in a dominant spell, resulting in 10 shots and 7 points, however if we look at the 2nd half as a whole Mayo’s offensive production was slightly above average. What Mayo did produce was a stellar first half that saw some excellent shooting with 76% of all shots ending in a score. 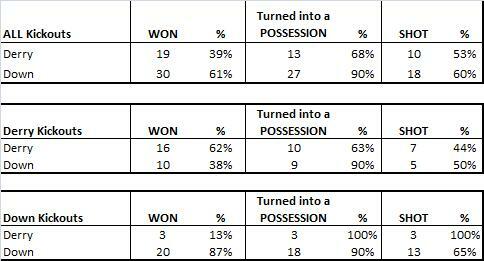 For 30 minutes they played as well as any team recorded to date with every possession producing a shot. As has been already noted Mayo’s shooting from play was excellent. Dillon, Varley & McLoughlin hit 7 points from 9 shots between them. It must be remembered that these returns include two woeful misses from the hand (from Varley in the 1st half & Conroy in the 2nd). Exclude these and Mayo were shooting the lights out. Dublin had their chances. They had 1 more shot than Mayo from play but scored 6 less points with Kilkenny, Connolly & B Brogan not scoring from 11 shots between them. This is a well documented issue with the Dublin front 6 – when B Brogan is off form then no one has consistently stepped up to the plate. They were getting by up until this point but eventually ran into a team that made them pay. As stated this is not new. It was a similar issue in 2010. If one of Kilkenny, McManamon or Connolly (A Brogan is a wonderful puppeteer, spraying balls left, right & centre however he is not a good shooter) do not step forward and take the scoring weight off of B Brogan’s shoulders then Dublin will struggle to get over the line again. Prior to yesterday only 30% of 45s (11 from 36) were converted in 23 matches. In fact take Cluxton’s previous efforts out and this drops to a meagre 23%. The ball striking from the ground in this game was superb with Cluxton & O’Connor hitting 6 from 6 on 45s. Even the 45 that Cluxton dropped short at the end was perfectly weighted to give the Dublin forwards a chance to get a fist on it. The expected return doesn’t really do justice to this 45 success rates. I haven’t extracted returns from 45s out from other frees between the 21m & 45m line so they are treated as ‘normal’ frees. This is one obvious weakness of the database that will be rectified once I start making amendments after the season ends. The free taking all round was excellent though the relative ease of Brogan’s frees can be judged from the fact that his expected return was lower than O’Connor’s even though O’Connor missed one shot. McManamon’s return got hammered because he didn’t score from a free in front of goal (94% of these frees end in a score). There are just not enough instances of players going for goals from these positions to give them a different weighting than those frees that take a point. –> C Kilkenny showed glimpses of what anyone watching underage football has seen over the past number of seasons. To have the courage to step up, in that atmosphere, and be the joint top shot taker is something else. To be able to back it up with scores must be very exciting for Dublin fans. –> B Brogan is slightly hard done by in these returns. 3 of his 4 shots were shots at goal with 2 blocked and 1 saved. As well as hitting his 6 frees he also ‘earned’ 2 of Cluxton’s 45s & 2 of his own frees. He had a good game – he is just judged harsher than others due to the stellar play we know he can produce. 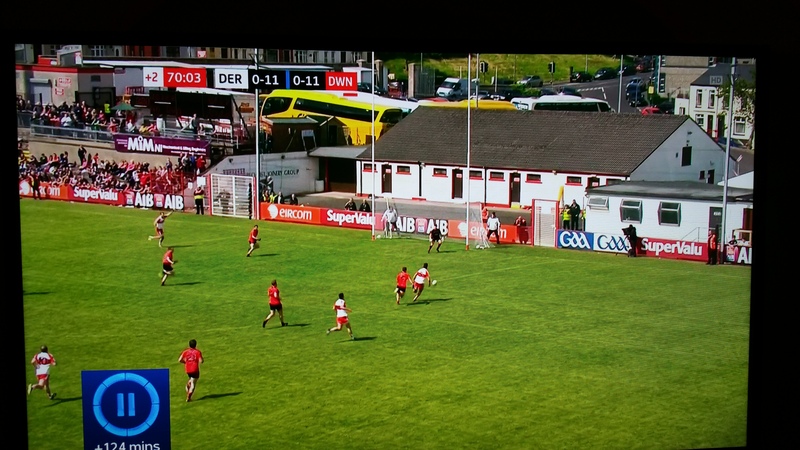 This was the first Mayo game I charted this year (thanks to Sky+ gremlins for the Connacht final!) and that’s certainly an eye-opening entry. To have 51 possessions in a game is remarkable – they absolutely lorded it over Down. Despite the fact that they had so much possession they weren’t wasteful – their shot rate was well up there with the best performance of the weekend (Cork @ 84%). Perhaps the one area of concern may be that despite the pressure being off in the second half they missed a number of easy chances – an above average success rate with a negative Expected Return shows that they missed more of the shots they were expected to get. Down just couldn’t get enough primary ball to make an impression. 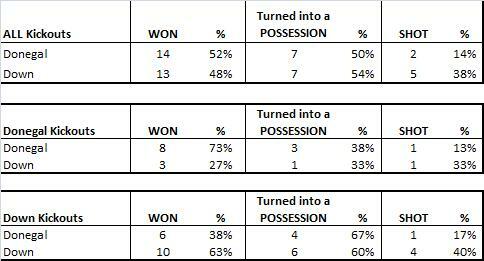 Their shot rate has been fairly consistent (75% in this game; 76% vs Donegal & 77% vs Monaghan) but if you know that you are going to convert three quarters of your possessions into shots then you also know that 24 possessions isn’t enough. Again Mayo’s shooting was a bit below par but if you are taking 33 shots from play in a game you can afford for your returns to be average. One point that will worry Mayo is the loss of Andy Moran. He ‘only’ scored one point from play however he set up Doherty’s goal, won a 45m and was also fouled for 3 frees that led to points. This was all mainly in the first half when the game was still alive. Cillian O’Connor’s free taking was average – he missed a 45m (isn’t everyone this year??) and a free out on the right hand side. He has a round the corner action when striking a free; although he scored two frees from inside the 21m on the right hand side it is noticeable that the one free he missed was on that side also. I have only ever charted this game so I am unsure what his strike rate is like – however this may be an issue if following games end up being close. A quick word on Dillon – as can be seen below he had a terrific shooting day.